Not only do we look out for our clients but also for our community. 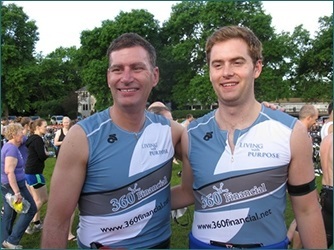 We at 360 Financial believe in paying it forward and are very involved in our community. 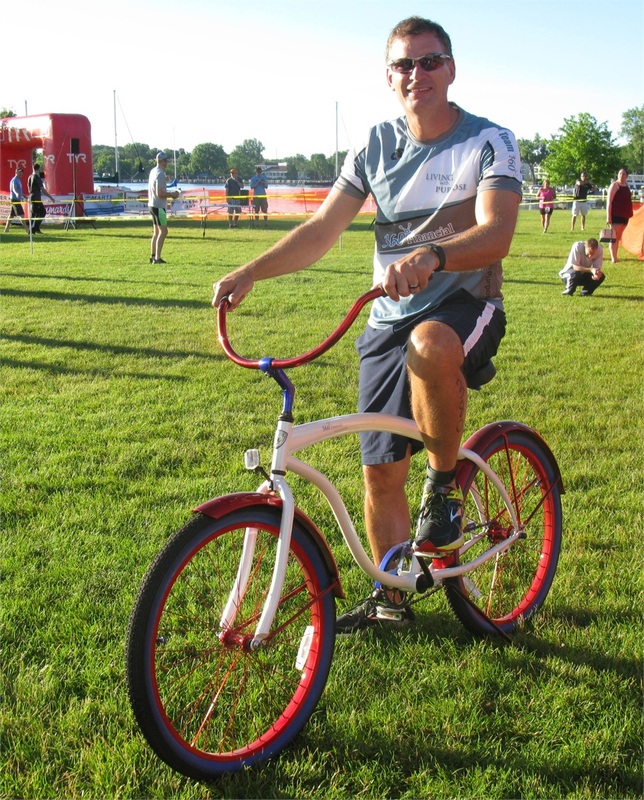 We sponsor the Toys for Tots drive and are a major sponsor of Lake Minnetonka Triathlon. 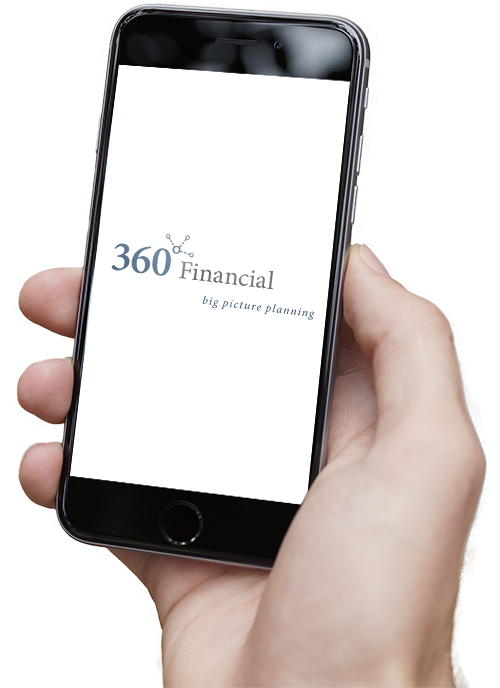 We also offer each 360 Financial employee paid volunteer time. Another holiday season calls for another round of toy collecting! With the help of Team 360 and our fabulous clients, we were able to collect a total of 103 toys! Though this is a lower number than last year, Team 360 was excited to collect so many toys and bring happiness to so many local children! You can view our Kare11 News appearance right here! Thank you to all of our clients who helped us donate so many toys this holiday season! Kare11 News and Toys For Tota are not affiliated with LPL Financial. 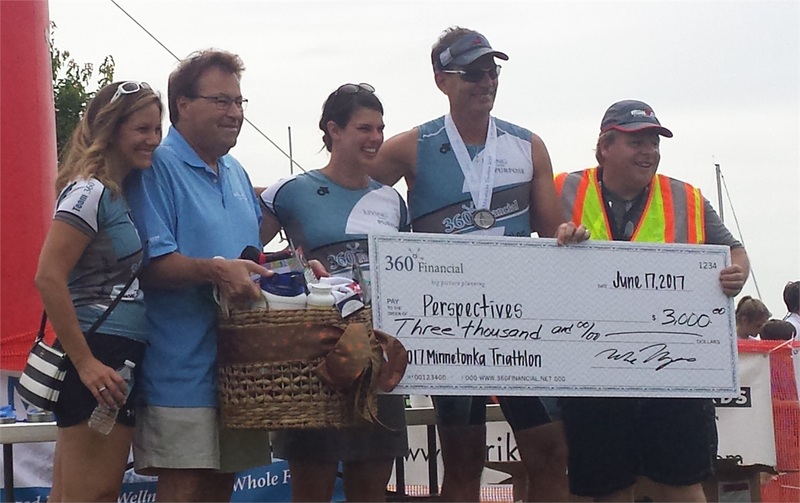 This was our 8th year sponsoring the Lake Minnetonka Triathlon. 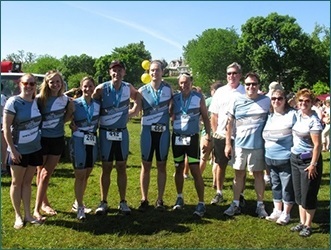 Every year, our firm uses the triathlon as a fundraiser for a local Minnesota charity. This year, we chose Can Do Canines. Can Do Canines is a local organization that strives to enhance the quality of life for people with disabilities by creating mutually beneficial partnerships with specially trained dogs. These dogs go through an extensive training and are paired with someone who needs assistance. In past years, we've had a couple Team 360 members participate in the triathlon and this year was the largest Triathlon Team 360! We had 6 of our staff signed up for either doing the full triathlon or participating in a team. Throughout the weeks our athletes trained hard, supported each other, and share our fundraising efforts with family and friends. 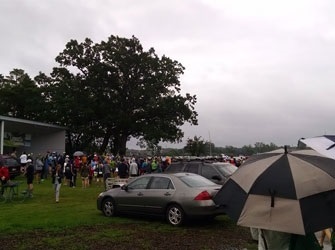 Though our Team 360 athletes were ready to go come race day, the triathlon was cancelled due to heavy rain and lightning. We were disappointed that it was cancelled, but it was a good safety call made by the triathlon coordinator. 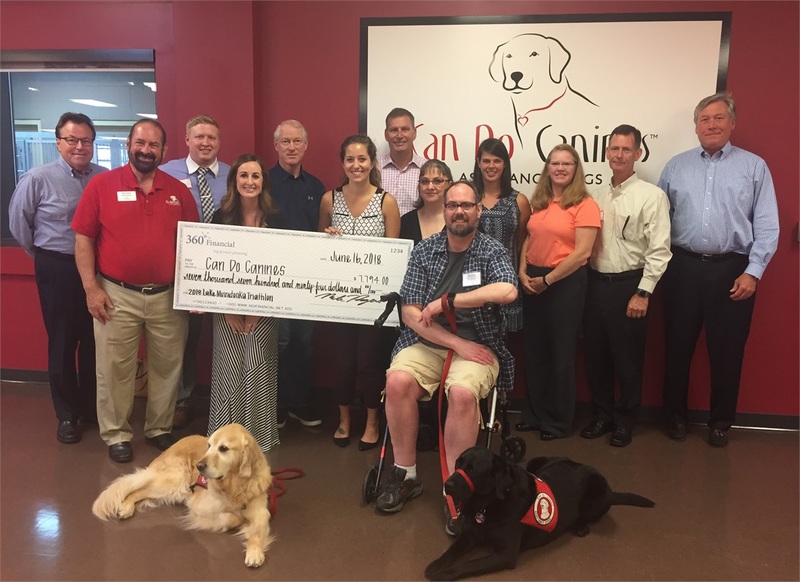 With the help of our family, friends, and clients, 360 Financial was able to raise $7,794 for Can Do Canines! We are incredibly proud and thankful for everyone who helped us reach AND exceed our original goal of $5,000. Thank you to all of our family, friends, and clients who helped us raise money for such a great cause! 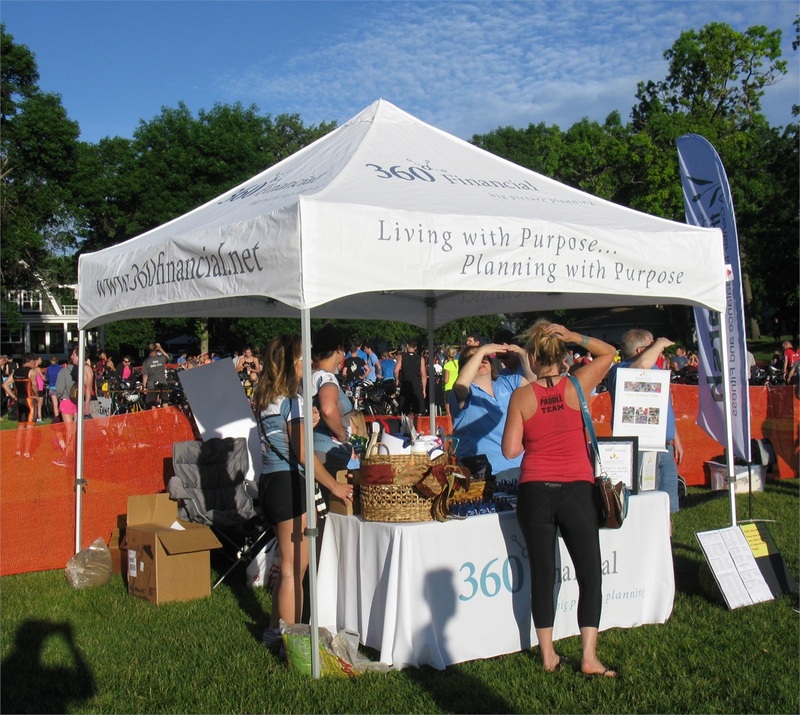 Can Do Canines and Lake Minnetonka Triathlon are not affiliated with LPL Financial. The holiday season was in full swing and with that comes the giving season. 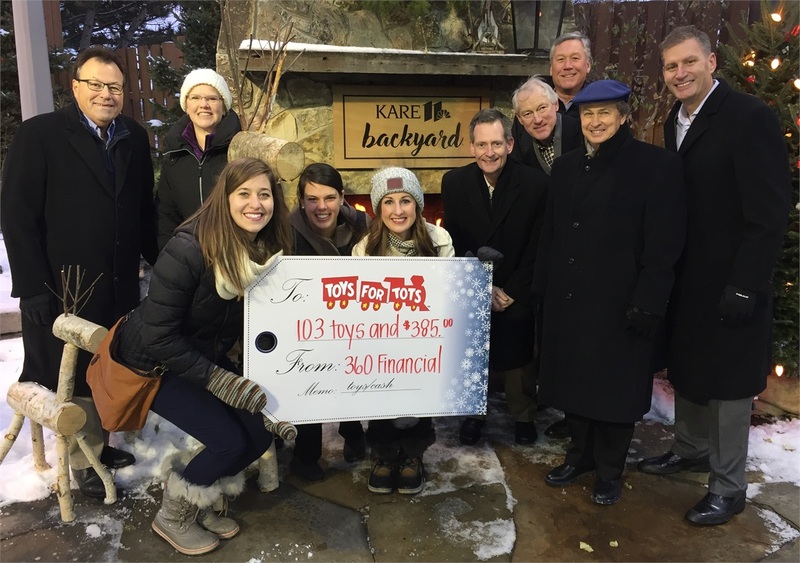 We at 360 Financial celebrated this 2017 season by setting a colossal goal to donate 360 toys to Toys for Tots! Our office was a drop off site for toys and with the help of our clients and local community we were able to donate $510 and 119 toys! Even though we didn't reach our goal, we exceeded our donation amount from last year and still was able to donate a bunch of toys! You can view our Kare11 News debut here where we talked about how we were able to collect so many toys! Thank you to all of our family, friends, and clients who helped us donate so many toys to such a great cause! 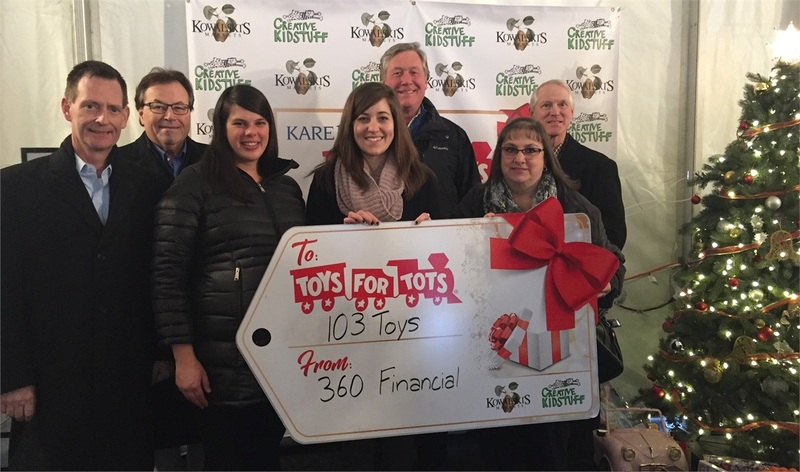 Kare11 News and Toys for Tots are not affiliated with LPL Financial. We couldn't have asked for a better day to run, bike and swim! We had great weather and were surrounded by wonderful people and athletes from all over the area. Our 360 community and team were able to donate $3,000 to an organization, Perspectives. Perspectives is located in St. Louis Park, MN and has been helping community mothers and their children for over 40 years. Their mission is to assist mothers recover from addictions, poverty, mental illness, lack of nutrition, and homelessness through providing housing and services to get their family in a safe and clean environment. All of us at 360 Financial are proud to help out this great organization and our community. Thank you to all who donated and participated in the triathlon. See you next year! Perspectives is not affiliated with LPL Financial. It was a great day for a triathlon! No rain this year! Our goal in doing this triathlon every year is to raise money for a local organization whose goal is to create a better community. This year we chose to donate the funds we raised to Greater Minneapolis Crisis Nursery. This great organization works to end local child abuse and neglect. Their goal is to create strong, healthy families and give kids a better future. 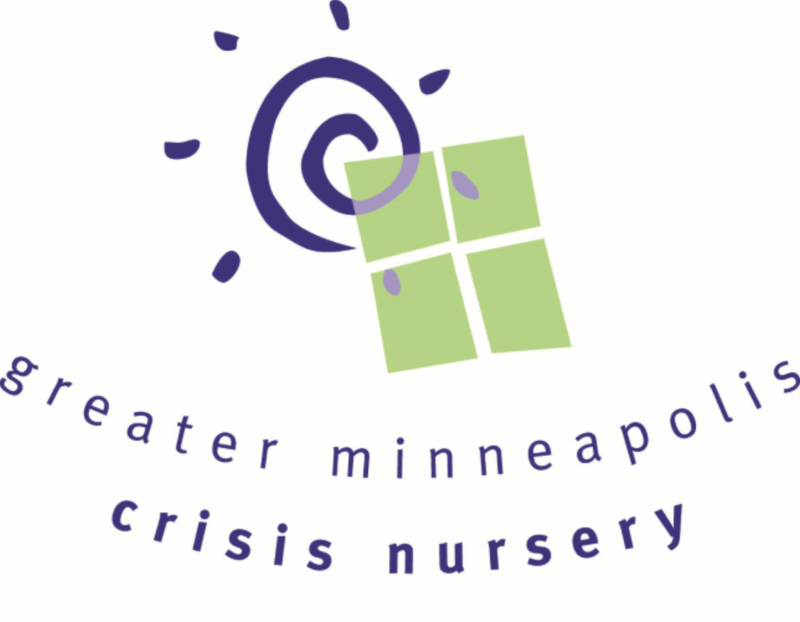 After all the money was tallied, we were able to raise $4,837 for Greater Minneapolis Crisis Nursery, including matching funds from 360 Financial! THANK YOU TO EVERYONE WHO DONATED! We can't wait for next year! 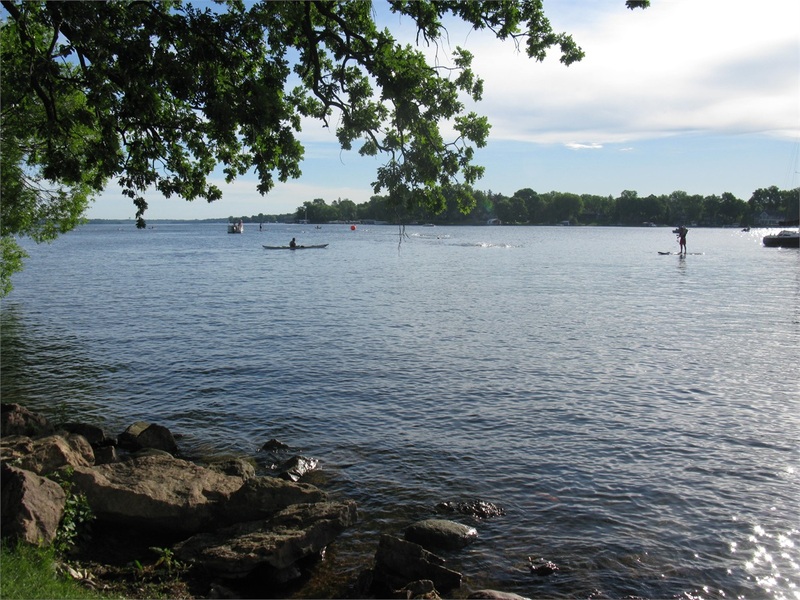 Most of us have heard some variation of “if you don’t like the weather, wait 30 minutes and it will change.” Well, that’s what happened Saturday, June 20th when Team 360 arrived at Lake Minnetonka in Excelsior to participate in the Lake Minnetonka triathlon! Not so much the 30 minutes, but definitely a change in weather! The early morning hours started with lightning and heavy rains, followed by sprinkles, and then sunshine. Unfortunately, the sunshine didn’t arrive until after the swim portion of the triathlon had been cancelled and the race participants had already started on the bike portion. But the weather didn’t prevent us from achieving our ultimate goal at the event – to raise funds for ICA Food Shelf! 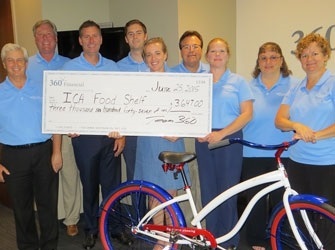 When all the dollars, checks and online donations were tallied, we were able to raise $3,647.00 for ICA Food Shelf, including matching funds from 360 Financial. This puts our cumulative fundraising efforts for ICA at $13,722.40! THANK YOU TO EVERYONE WHO DONATED! And we’ll hope for a rain-free triathlon next year! 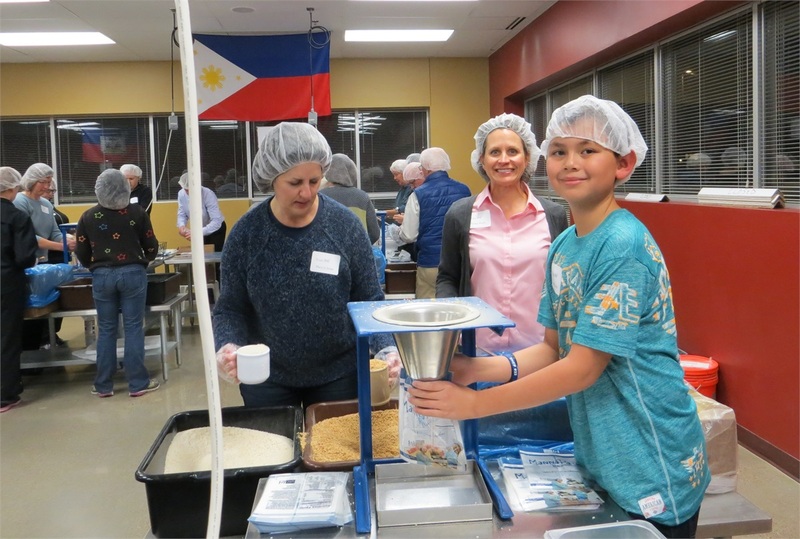 This past November 18th, clients, family, and friends joined the staff of 360 Financial at Feed My Starving Children in Chanhassen for our annual Thanksgiving tradition of packing meals for the neediest children on our planet. 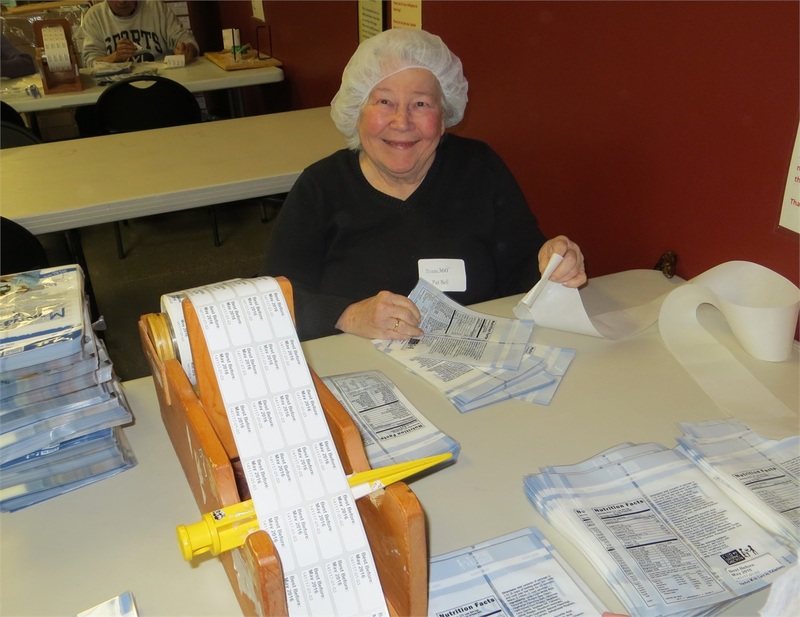 During our shift, the 44 volunteers of Team 360 helped pack 13,824 meals – enough to feed 37 children for an entire year! 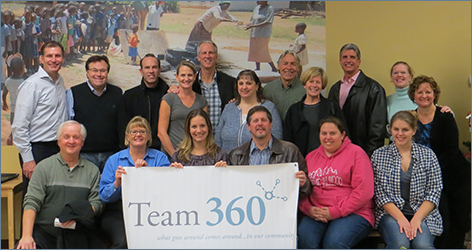 360 Financial also donated $20 on behalf of each Team 360 volunteer, providing FMSC with $880 to purchase ingredients for meals. In addition, we noticed that many of Team 360’s volunteers personally supported FMSC by purchasing items from their store and/or donating money. Thank you for your generosity! This was Team 360’s fourth trip to FMSC and our largest in terms of number of volunteers, meals packed and money raised for Feed My Starving Children. Way to go Team 360 – can’t wait to see what happens next year! To everyone who volunteered…a heartfelt THANK YOU for sharing your time, talent and resources! Always an exciting event, this year’s Triathlon was no exception. 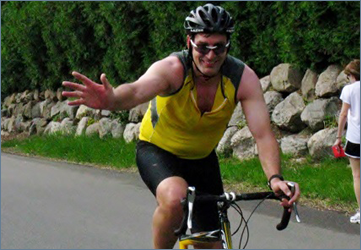 In addition to Mike Rogers returning for the 5th year in a row to swim, bike and run 18 ½ miles, 360 Financial’s newest employee Ryan Schilling participated in his first-ever triathlon! Incredibly, Mike’s and Ryan’s total race times were less than 30 seconds apart! But most exciting of all was collecting $4,519.40 for ICA Food Shelf – with $1,500 coming from matching funds by 360 Financial – plus several boxes full of food! 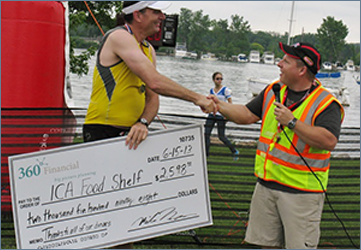 Through the generosity of clients, friends, race participants and other community members, Team 360 has now raised more than $10,000 for ICA Food Shelf since we began fundraising 5 years ago. Thanks to everyone who had a part in it! 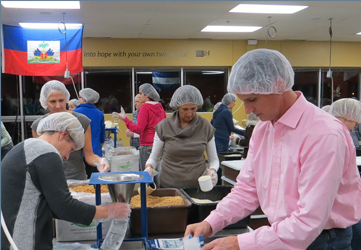 On November 19th, Team 360 was joined by clients, family and friends at Feed My Starving Children in Chanhassen for our annual Thanksgiving tradition of helping others in need. We were excited to be part of the hard-working crew that night – a total of 11,448 meals were packed during our shift. Those meals will feed 31 children for an entire year! 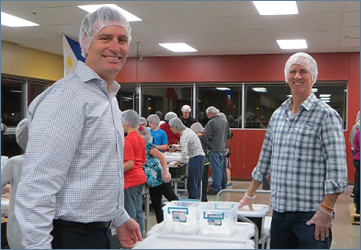 In addition, 360 Financial’s cash donation helped FMSC replenish ingredients used that evening. What an awesome way to give back to the community – thanks to everyone who participated! 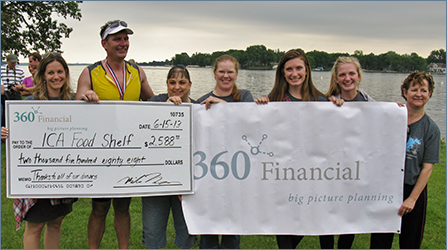 With overcast skies on an early Saturday morning in June, Team 360 Financial cheered for Mike Rogers as he crossed the finish line at the Lake Minnetonka Triathlon for the fourth consecutive year. He continued his efforts to raise awareness for the ICA Food Shelf, an organization that serves 7 communities in the western suburbs. 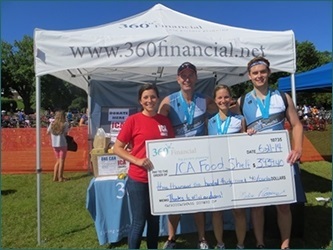 With 360 Financial’s matching funds and support from clients, friends and community members – which continued even after the triathlon – we were able to raise nearly $2,700 for the ICA Food Shelf. Over the past three years, Team 360’s efforts have resulted in donations to ICA of more than $5,500. Thank you to everyone who supported our endeavors!